Supermassive black holes millions to billions times the mass of our Sun lie at the heart of most, maybe all large galaxies. Some of these power brilliantly luminous, rapidly growing objects called active galactic nuclei that gather and condense enormous quantities of dust, gas and stars. More than a thousand X-ray signals illuminate a patch of sky called SXDF. The false colors in this image from a camera aboard the XMM-Newton spacecraft indicate the energy of the sources — from red for the weakest signals through green to blue for the strongest. 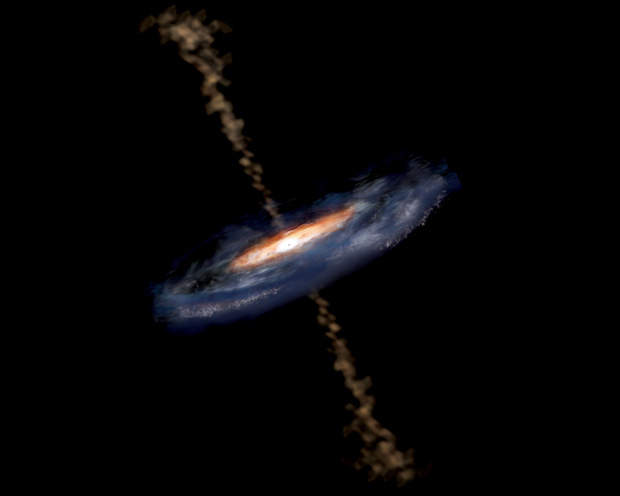 Image courtesy of Ian Stewart and Mike Watson (Leicester University/XMM-Newton Survey Science Centre)and ESA. Image: NASA/SAO/Ralph Kraft et al. 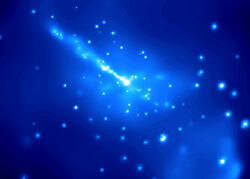 So as suspects in the quenching of star formation, active galactic nuclei have been exonerated. And because the astronomers saw similar signals stretching far back into time, they conclude that the physical processes that trigger and fuel active galactic nuclei haven’t changed much in the last half of the universe’s existence. 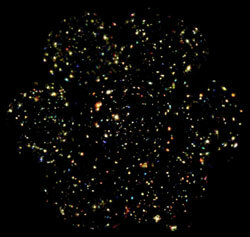 Yet starmaking has ceased in many galaxies, probably when they ran out of gas, though it’s not clear how that happens. The interstellar gas could all be used up, turned into stars, but Coil studies another possibility: fierce galactic winds that have been seen blowing gas and dust from so-called starburst galaxies.